What could be better on a chilly, rainy fall day than a bowl of hearty soup? Not much in our books. We really couldn't be more happy to have soup season on us again and this soup was a great way to kick it off. This soup is super simple to make and, despite that fact it doesn't have a huge list of ingredients, it's full of flavor. 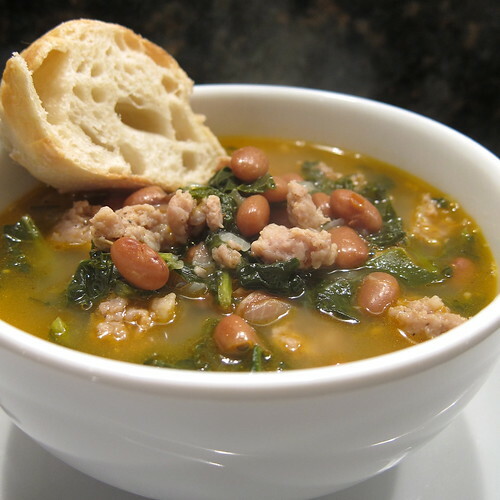 The trick is to use good beans and sausage, both of which give a lot of flavor to the broth. We used Ranch Gordo Yellow Indian Woman Beans, which is a small bean that retains it shape while cooking yet still gets creamy on the inside. They have a rich, earthy flavor. You want to make sure the sausage is well spiced, some brands can be a little bland (which is why we started making our own). If yours is, add a little extra fennel and garlic with the red pepper flakes to the broth. A good dose of seasonal kale ups the healthy quotient. Rinse the beans. Put them in a pot or crock pot with about 3 cups water. Simmer for about 2 hours until almost tender. Drain. Heat the olive oil in a large soup pot over medium-high heat. Add the onion and garlic and sauté until the onion becomes translucent. Add the sausage and cook through. Stir in the red pepper flakes and tomato paste. Add the bay leaf and chicken stock. Bring to a boil, cover, reduce heat and simmer for 1 hour. Remove the cover. Taste the broth and add salt as needed. Add the kale and simmer uncovered until tender, about 30 more minutes. What soup is fall making you crave? Elle - It's pretty easy when you have the grinder for the kitchen aid & aren't putting the sausage into casings. I'm usually not soup crazy, but for some reason this year I'm craving all different kinds. This one sounds so good. I'm all about kale right now. This is a good looking soup! We've just had some warm weather this week, so I am back thinking about gazpacho and iced pea soups!